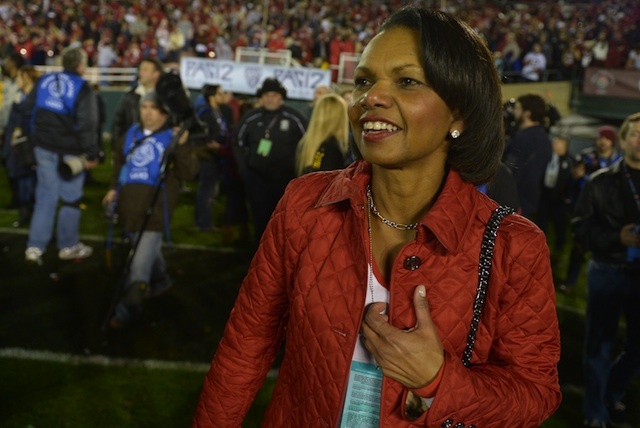 Home › college football › We All Know Why Condi Rice’s Selection Has Been Panned, Right? We All Know Why Condi Rice’s Selection Has Been Panned, Right? That’s what I have been thinking since this whole hubbub regarding Condoleezza Rice’s selection to next year’s playoff selection committee has been playing out. Look, it doesn’t take a rocket scientist to figure out that those dudes (and many others) are upset that a woman was selected to serve on the playoff selection committee. Let’s look at Dye’s comment: “To understand football, you’ve got to play with your hand in the dirt…” Really coach? If that’s the case, more than half of the college football analysts and sportswriters wouldn’t have jobs covering college football. Fowler wouldn’t be the host of “College GameDay”. Paul Finebaum would not have a successful career in sports talk radio nor a job covering the SEC for ESPN. Tom Brando would not be an ultra successful sports talk show host on CBS Sports. Hell, a huge segment of college football coaches would not be coaching. And why stop there, look at the other folks on the selection committee. Former Big East commissioner Mike Tranghese is also expected to be on the committee even though he did not play college football. And how about the notion of the current BCS system (which I liked) that uses six computer formulas that never played college football and one poll that is based on the votes of many media members that never played college or pro football? Rice may not know a lot about college football. But I’ll say this: if she was able to navigate through murky diplomatic waters with the likes of Russia, Iran, Iraq’s Saddam Hussein, Venezuela’s Hugo Chavez, and help manage egos in the George W. Bush administration while serving as the National Security Advisor AND Secretary of State, then I am pretty confident that not only would Rice be able to get up to speed on all that is college football, that she will be able to hold her own in a room full of good ‘ol boys in selecting the best four (which will eventually become eight) college football teams to participate in the playoffs. I didn’t want to take a lot of time in discussing the obvious. Here’s hoping Dye and Pollack (and others) are able to take less time to see how silly and male chauvinistic their comments and thoughts were. Didn’t you know everyone’s a football expert if they’ve played Madden one time! Who needs professionals making football decisions. Not college football because college football NEEDS to stay wrapped up in politics to keep the amateur players from becoming NON-AMATEUR! This really has nothing to do with what is right or wrong or who is better at determining who deserves to be in a playoff, because if that were the case there are volunteer Pop Warner coaches with more credentials than Rice or almost any politician for that matter. Amen and adios!